Pictured (L to R): Susan Goins, SOMC Hospice; Cindy Stevens, Edgewood Manor; Melissa Dever, Alzheimer’s Association; Erica Kegley, SOMC Senior Behavioral Unit; Brenda Stiltner, Job and Family Services. 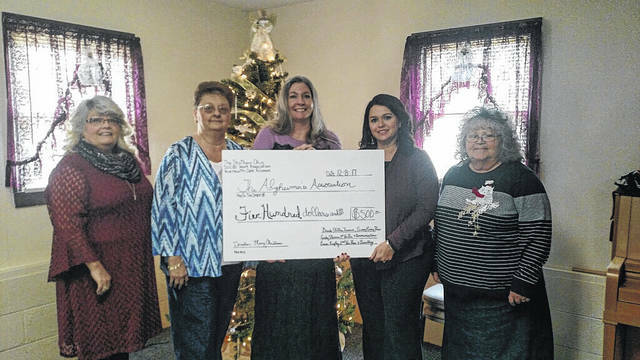 The Southern Ohio Social Work Healthcare Alliance has ended out its yearly fundraising campaign and presented checks to both The Alzheimer’s Association and the Cincinnati Shriner’s Children Hospital. Every year, members of the Southern Ohio Social Work Healthcare Alliance pay due and conduct fundraising activities with two goals in mind. Funds are used to provide a senior day in May which is a free event for seniors that provides a full day of activities and resources. Then, at the end of each year, the Southern Ohio Social Work Healthcare Alliance donates funding in support of two local charities. Charities are voted on by group members. This year’s recipients were given $500 each. “Everything we do is for the betterment of our community, and we try to raise the money in order to try to improve and look forward to helping seniors as well as children in the community,” founding member and Southern Ohio Medical Center (SOMC) Hospice representative Susan Goins stated. Erica Kegley explained that Southern Ohio Social Work Healthcare Alliance is a networking group that allows members to share knowledge and resources. “We are a group of social workers, marketers, home health companies, nursing homes and hospitals,” Kegley stated. Members of Southern Ohio Social Work Healthcare Alliance come from across the region and have a range of backgrounds, each contributing differing skill sets, backgrounds and experiences for a common goal. They have been in operation for 26 years.